This tart came about because I love the idea of cheesecake, but often after just one or two bites, I’m done. Here a thin layer of cheesecake is nestled in a crisp crust and the amount of rich, creamy cheesecake is just right. You can top it with anything you like, but this fruit mélange is colorful and tasty. I use the creamy cheesecake tart component all the time as a springboard for other recipes: top it with lemon curd and fresh blueberries….or a compote of sweetened tart cherries….or sliced fresh strawberries brushed with jelly…you get the idea. FOR CRUST: Whisk together flour, sugar and salt in a medium sized bowl until combined. Add butter and cut in, using a pastry blender or fingers until mixture resembles a coarse meal. Whisk together the cream and egg yolk in a small bowl. Pour liquid mixture over dry mix in a thin stream mixing well with a large wooden spoon. Turn out onto floured board and knead until it comes together in a ball. Flatten ball into disc; wrap and chill at least 2 hours or up to 2 days. Roll out dough on lightly floured surface to a 12- to 13-inch round. Transfer to a 10- inch fluted, removable bottom tart pan. Press over bottom and up sides of pan. Pierce all over with a fork. Freeze for 30 minutes. Preheat oven to 375 degrees F. Line tart with foil and fill with pie weights. Bake for 20 minutes, remove foil and weights and bake for 5 minutes more or until just beginning to turn golden, but not completely baked. Remove from oven and turn oven down to 350 degrees F. Melt guava jelly in microwave and brush over bottom of crust. FOR CHEESECAKE: Beat cream cheese in mixer’s bowl with flat paddle attachment until soft and smooth. Add sugar and continue beating until light and fluffy. Beat in the egg, then vanilla. Briefly beat in crème fraiche. Pour into tart shell and bake for 30 – 35 minutes or until set. The cheesecake will puff slightly, but the center will still jiggle a tiny bit. Cool on rack. Refrigerate at least 2 hours. FOR TOPPING: Melt guava jelly in microwave and brush over top of cheesecake. Peel and slice kiwi in 1/4-inch thick rounds. Slice passion fruit in half crosswise. Peel, seed and cut papaya into 1/4-inch slices. Peel and pit mango and cut into 1/4-inch dice. 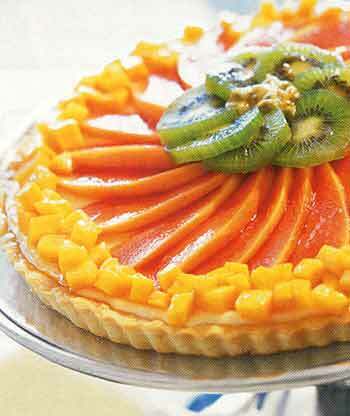 Place overlapping papaya slices around the outside of the tart with one end of each slice pointing toward to center of the tart and the other touching the edge. Then form a circle of overlapping kiwi slices. Place diced mango in a small ring towards the center. Scrape passion fruit seeds into a mound in the center. Serve immediately or refrigerate up to 3 hours. Best served the day it is made.